After returning from a two-week holiday stay with family in Rhode Island, Jeff and I were in a bit of a funk. San Diego suddenly seemed too quiet, too sunny, too bland. We missed the crunch of snow beneath our feet, the hearty bowls of quahog chowder and the sight of a pink and orange Dunkin' Donuts on every street corner. More than anything, we missed the accents. "You want sugah in your cawfee?" "Hey, Joe, we got any more baked, stuffed lobstahs in the back?" But my personal favorite, which you'll hear most commonly at Italian delis, is, "Yeah, give me a sossig and peppiz." Sossig and peppiz. It's one of the ultimate Italian-American comfort foods. Sweet or hot Italian sausage is pan-fried with onions and peppers and stuffed into a long Italian roll. Melted provolone or mozzarella is optional. Since we were really missing home, we feared that sossig and peppiz alone wouldn't be enough. We needed more solace, specifically in the form of pasta. 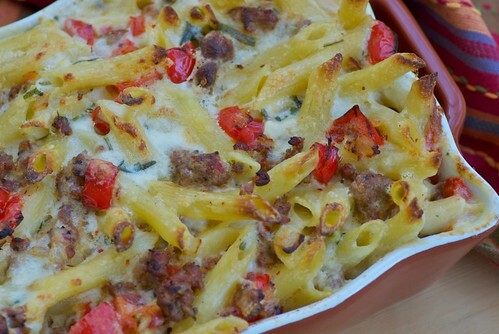 Hence today's recipe: Italian Sausage and Peppers Macaroni and Cheese. Spicy hot Italian fennel sausage, onions and red bell peppers are sauteed until browned and glistening. Then they're tossed with chewy lined penne and drowned in a soothing cream sauce made with Italico cheese. Like mozzarella, Italico is a mild, slightly sweet and tangy semi-soft cheese that turns irresistibly gooey when it melts. It was destined for macaroni and cheese, grilled cheese sandwiches and pizza. It's also one of the cheeses used for the Wisconsin's Milk Marketing Board's second annual 30 Days, 30 Ways with Macaroni and Cheese blog, in which I'm participating. Just so you know, the sossig and peppiz mac n' cheese did the trick. Jeff and I have been feeling much better, though we still miss seeing Dunkin' Donuts. 2. In a large skillet over medium-high heat, warm olive oil. Add onion and saute 3 minutes or until softened. Add sausage and cook for 8-10 minutes or until browned all over and no longer pink. Add red bell pepper and cook 2 minutes until softened. 3. Cook pasta in salted water, about 2 minutes short of being fully cooked; it will finish cooking in the oven. Drain the cooked pasta, but do not rinse. 4. Meanwhile, melt butter in a medium saucepan over medium-high heat. Whisk in flour. Gradually add milk, whisking continuously until it reaches a boil. Reduce heat and simmer for 5-7 minutes, or until thick and bubbly. 5. Add cooked sausage and pepper mixture, Italico cheese, cream sauce, crushed red pepper flakes, salt, black pepper, basil and parsley. Stir well. Pour into prepared baking dish. Bake for 30 to 35 minutes or until the top is golden brown and the cheese sauce is bubbling around the edges. I love Italian sausage any way you cook it, but with mac and cheese it has got to be great. Cannot wait to try this! What cheese would be a good substitute if you live in tiny town USA? Oh, that does look like happy food! Next best thing to home. 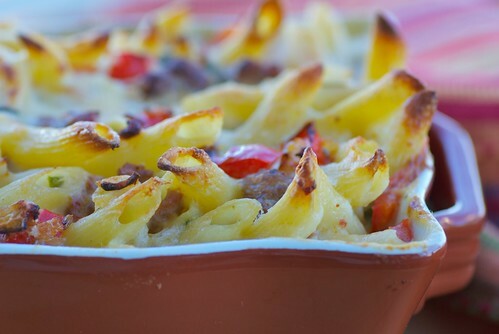 I love the way you combined mac and cheese with sausage and peppers. So good!!! Looks delicious! teachercooks-Me too. I think Italian sausage should have its own food group! kristina-I would go with a good mozzarella. My two most favorite things... mac & cheese and sausage and peppers. I know what I'm making for dinner...Can't wait to try it! I love the way your spelling gave the accents in this post! I laughed so hard! The recipe looks terrific, too. My family may not be from Rhode Island, but they've got the Italian accent thing going on. Ricawt, mutzerel, etc. Although they're more of a sawwwwsidge than a sossig kind of bunch given the Brooklyn/Bronx infiltration haha. I've never had or heard of that cheese before but now I'm craving it. Nothing like a good mac and cheese to comfort you during these cold hard times! a simple recipes, but like always !